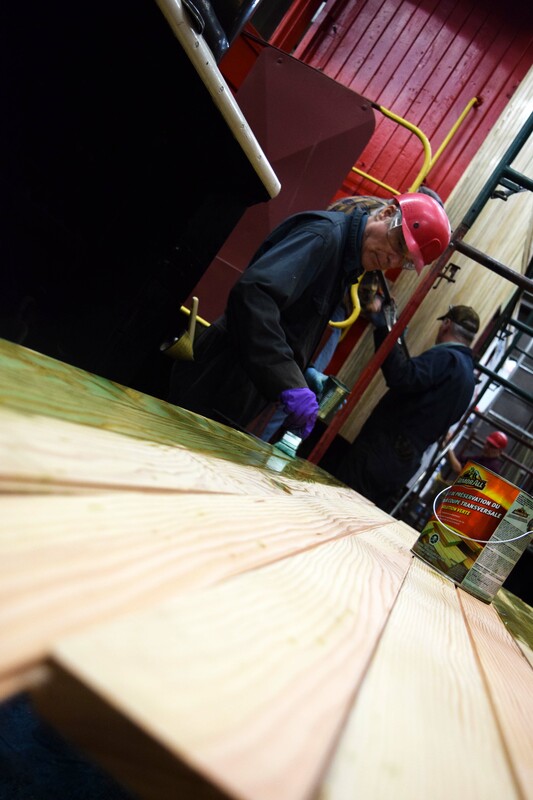 Bill Weiler, a member of the Bytown Railway Society, stains wood planks in preparation for the restoration of the 1924 daycoach. Here at Ingenium, National Volunteer Week (April 7-13) provides an opportunity to acknowledge and celebrate all of the volunteers who enhance the unique visitor experiences we provide across all three museums — the Canada Agriculture and Food Museum, the Canada Aviation and Space Museum, and the Canada Science and Technology Museum. Guest writer Connor Wilkie recently sat down with some of the dedicated volunteers at the Bytown Railway Society to talk about why they dedicate their time to volunteerism. If you’ve ever been to the Canada Science and Technology Museum, you’ve probably noticed the iconic train sitting on the front grounds. Historically, the museum has been known for its well-loved collection of trains, but what visitors might not know is that many of the locomotives are maintained by a dedicated team of volunteers that predate the museum’s conception in 1966. As the volunteer coordinator for Ingenium – Canada’s Museums of Science and Innovation, Cédric St-Amour is responsible for maintaining relationships and overseeing volunteer operations across three museums. Duncan Dufresne had been volunteering with the museum since 1966. Throughout that time Dufresne accumulated an impressive amount of volunteer hours. Duncan Dufresne was one such volunteer. Dufresne — who passed away in 2012 — was a pillar of the group and had been volunteering since 1966. During this time, Dufresne had volunteered 12,000 hours during his time with Ingenium. Through their varied skill sets, the BRS volunteers contribute a unique service that not many museums are able to take advantage of. Many of the volunteers have actually worked on, or had some kind of experience with the railway industry. Through the experience they have, the BRS volunteers are in a more qualified position than most to help advise the museum on their collection. The BRS volunteers continue to elevate the museum experience for visitors. Although it’s not operational now, the volunteers used to help out with a very special program that gave guests an immersive experience at the museum. Phillip Jago, a member of the BRS, has been volunteering his time to help restore and maintain the museum’s collection for the last 40 years. Phillip Jago poses next to a train outside the Canada Science and Technology Museum. Until 2014, the BRS volunteers would offer train rides in conjunction with the museum. Jago — as a student in university — did some work on the railway; he worked in the freight department on the boxcars. Jago didn't mind if the work wasn't glamorous, he just wanted to be on the railway. Over the years, he has been involved in multiple restoration projects. Currently, Jago and the team of volunteers are restoring a 1924 first-class daycoach, which was originally bought for the Canadian National Railway when they were a brand new organization. According to Jago, the end goal for many of these restoration projects is to have these artifacts be operational. He also believes it’s important to have these artifacts well preserved, so the public can see the evolution of the equipment. “I think it’s important so people can see the evolution of technology, which is one of the fundamental goals of Ingenium at the end of the day,” says Jago. He explains it isn't all about restoring and maintaining the trains, it's about teaching some of the newer and younger volunteers important skills, and passing on a passion for the railway. One challenge for the BRS is attracting new, younger members. Ian Stuart, one of the younger BRS members, started volunteering through a program called Katimavik which connects youth across Canada with volunteer opportunities that they might not regularly have. Stuart enjoyed the experience, and decided to continue volunteering; he chose to spend his time with BRS. Along with the knowledge he gets from some of the older BRS volunteers, Stuart chooses to come back because of his interest in railway history as well as having the opportunity to contribute to something through working with his hands.